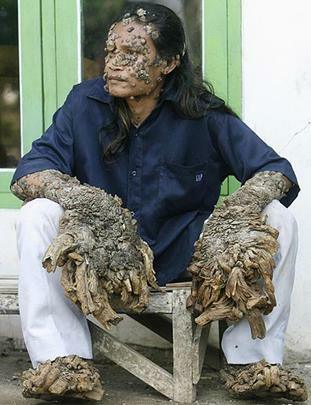 Epidermodysplasia verruciformis or colloquiallycalled tree man illness is a rare autosomal recessive genetic disorder that affects your skin and increases the risk of carcinoma of the skin. It causes abnormal susceptibility to human papillomaviruses (HPVs), which eventually leads to the overgrowth of scaly macules and papules, especially on the feet and hands. Although several types of HPVs contribute to this condition, HPV types 5 and 8 are most commonly associated with tree man illness. These types are usually found in more than 80% of normal population but they aren't reactive and don't cause any symptoms either. The condition most often affects people between the age 1 and 20, but it may also hit middle-aged people as well. 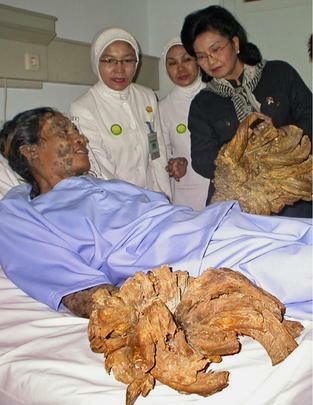 Keep reading to learn more about the disease and understand tree man before and after treatment differences. 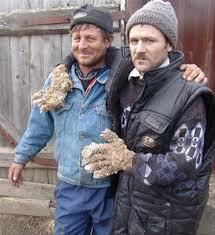 Numerous blogs published pictures of a Romanian man named Ion Toader who was diagnosed with tree man illness in March 2007. These pictures quickly gained world's attention. Toader underwent a surgery in 2013 and has been cured majorly with small reappearances. The case and tree man before and after pictures really became a hot topic but it wasn't as progressive as the case of Dede Koswara was. 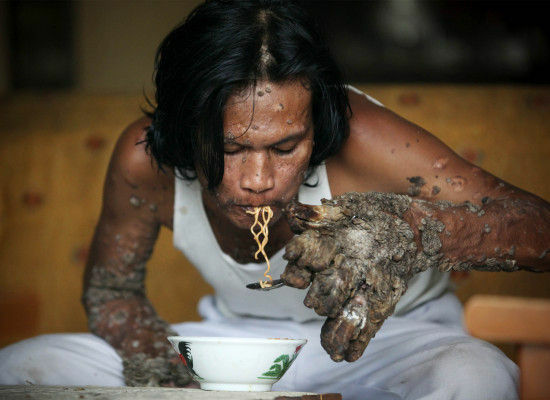 Dede Koswara is an Indonesian man with tree man illness. He became known when a video of this young man became public in November 2007. His story made it to ABC's Medical Mystery show in which he was addressed as 'Tree Man". It all started as simple wart on his knee but it turned his life upside down. The warts covered his body due to HPV. He lost his job and his wife left him. 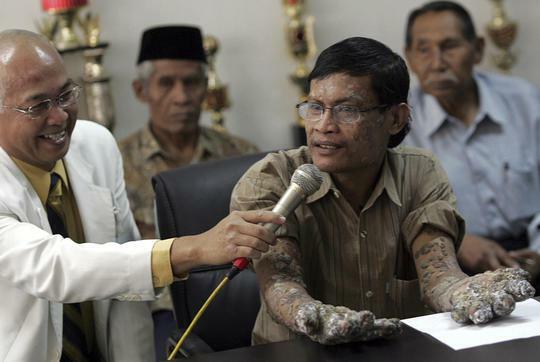 He was raising his two children in poverty resigned to the fact that there was no cure for his condition until August 2008 when he underwent a surgery and had more than 6kg of warts removed from his body. 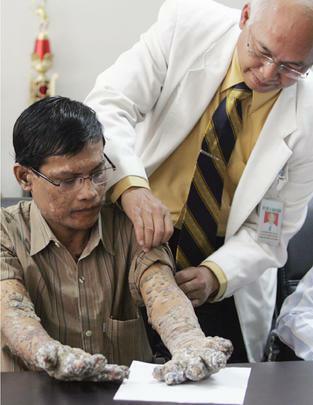 The surgery involved three steps – the first step was to remove massive horns and thick carpet of warts on his hands, the next step was to remove the smaller warts on his torso, head and feet, and the last step was to cover his hands with grafted skin. Dede's case was quite incredible, but it wasn't the only one. 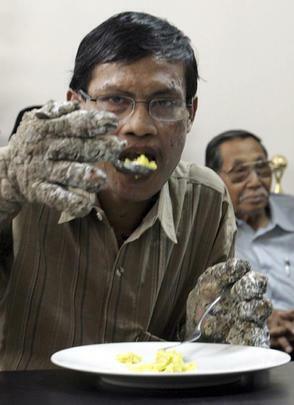 In 2009, the Discovery Channel aired another episode about the Tree Man disease, but this time it was about another Indonesian man. The title of the episode was "Treeman Meets Treeman". He was also from the same region as Dede and received the same treatment. Fortunately, the same treatment worked better for him. 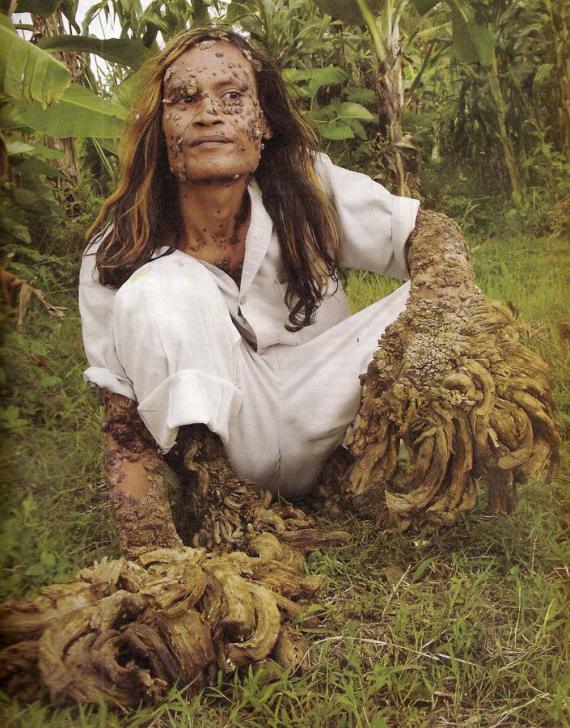 It is important to understand that though Tree Man before and after images are quite shocking, the disease is not contagious. Doctors check these people and their warts without an issue, and they have already confirmed that no one can get infected just by touching the person who has it. There are some specific symptoms of Tree-Man disease including the following. Your hands and feet will take the shape of tree branches – they will turn yellow-brown and extend up to 3 feet. Even though symptoms are often enough to tell it is Tree-Man disease, doctors can perform blood tests and take skin samples to confirm the presence of HPV. Genetic testing also helps confirm it. Treatment for Tree-Man Disease or Epidermodysplasiaverruciformis is quite complicated and involves taking a multifaceted approach. It is important to take steps to reduce the risk of cancer, and also use techniques to improve a patient's physical appearance. Patients will have to wear protective clothing because UV light can worsen the condition. They may have to use oral drugs as well as topical retinoid creams, such as imiquimod to limit the growth of abnormal skin cells. Different surgical procedures involve freezing off warts with liquid nitrogen. Sometimes, the warts are burned with electric heating devices and excised using scalpels. Despite all these approaches, some patients develop skin cancer and require additional medical help. Sometimes, surgeons remove those cancerous warts and replace the area with a graft from non-affected area of the body. Chemotherapy and radiation treatments are used when cancer spreads to the lymph nodes.